“Three weird aunts + basement party + drawing and sewing till our hands hurt but we keep on keeping on + lost mix tapes + lots and lots of dramedy.” This is the description written on the MySpace page of female trio, Explode into Colors. The Portland-based ladies, who have already made a huge splash in their local music scene, indeed know how to keep it real in terms of their prospective music careers, while remaining humorous and creating refreshingly unique “crunk” music along the way. 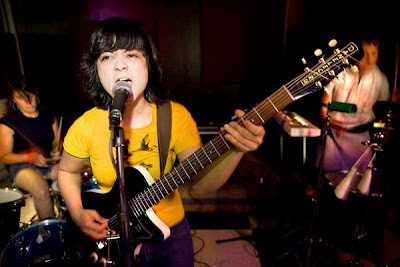 Here is my interview with baritone guitarist Claudia Meza, one of the three badass elements of the trance/dance/punk/funk/soul project, that is Explode into Colors. Can you describe how Explode Into Colors was created? Lisa and I got together to play in my basement. We asked Heather to join a bit later. We made a pact not to be a rock band and to have fun all the time. This would be our collective art project. Also, we made a pact not to be an art band. There you go! Most bands usually have to put out a record before generating buzz in the music scene. You guys did the opposite. (Congrats on winning the Best New Band Poll on wweek.com!) Did you expect to gain as much exposure as you did from your live shows? Thanks, and no we had no clue. I think the internet helped a lot, as well as our local magazines by being so supportive and actually interested in covering the local music scene. What influenced you as a band to try something different, in regards to taking a minimalist approach to music rather than making it complicated? Lisa and I had been playing very complicated music for a long time, but when I started playing drums I became transfixed by the simple dance beat and overtones that can be heard on the drums. So that became a really specific sound that I didn’t want trampled by complicated arrangements or distracting melodic motifs. I wanted it to sound spooky and driving. All of our musical influences of course come in to play. Heather studied West African drums, Lisa was going through a Krautrock phase when we first started messing around in my basement and has been playing drums forever. I was knee deep into dub, Yoko Ono, Laurie Anderson and revisiting a lot of composers I love, like Steve Reich, John Cage and Edgar Varese. Can you describe what instruments and formats of music are used to create your unique sound? Drums, percussion, keyboards, baritone guitar, tapes, effect pedals, and samples. Are you glad that EIC took off first in the Portland music scene? Portland is definitely a very special place: It’s supportive and people here are genuinely excited about music. I think with the internet, a band can reach a wider audience without needing local support or even a homegrown scene. Sometimes, kids don’t have the luxury of having a weekly magazine that wants to know what you are doing. We all have full time jobs. In order for us to go on tour, we need to make sure it would fit in all of our schedules and it was economically feasible. When we were asked to go on The Thermals tour, we had too much to deal with at home and we had nothing to sell. It seemed silly to go on tour without any official releases and no prospect of employment when we returned. If we were all 16 and living with our parents, we would have taken that tour as we love The Thermals very much as a band and as people. We also needed to focus on making sure the releases came out on time and focused on writing more songs. As for big shows versus little shows, nothing beats a house show for us but big shows are fun too when it’s at the right venue with the right people. I heard EIC will be releasing a 7” in September, as well as a future full-length release under the Kill Rock Stars record label. Will these projects consist of many songs already performed live? Yes. Ironically, the KRS single, “Eyes Hands Mouth,” never gets played live though. We might have to relearn that one. Are there certain elements of your music that you think will be better represented in a live atmosphere vs. a recording studio (and visa versa)? Oh, definitely. Drums are so visceral and I think hard to record. There is something exciting about being close to the impact. Recordings are where we focus on the arrangements and effects of things to get everything right but playing our songs live and in front of an audience is the most fun for us, for sure. I think that both formats, live and recorded, bring out different aspects of a song. For those who’ve never yet been introduced to Explode Into Colors, how would you best describe your music?